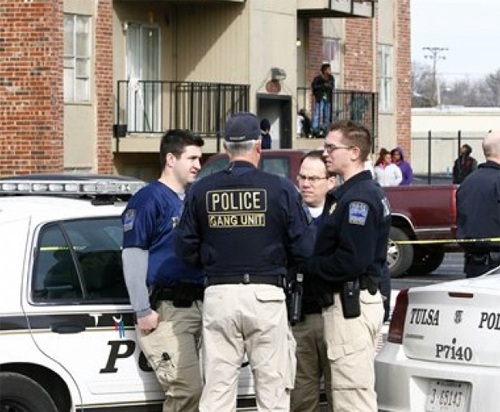 Police say four women in early 20s were found shot to death inside the apartment in a rugged part of south Tulsa on Monday, January 7, 2012, apparent victims of a midday shooting spree at a building near a park along the Arkansas River. They found a 4-year-old boy who was unharmed and couldn't know if the boy was related to any of them. Tulsa Police Officers from the Gang Unit Department gather after a quadruple homicide at Tulsa's Fairmont Terrace apartment complex. Tulsa Police spokesman Leland Ashley said, "Our detectives are beating the bushes and so are our patrol officers and our gang units." She added, "I don't want to strike fear in the community tonight, but we do have an individual or individuals who murdered four people. Do we know if there was a motive, like a jealous lover? We don't know that. We can't say if it was random or if someone knew (the victims)." Tulsa Police was hopeful that someone in the community would come forward with more information about the shooting incident. Comments or suggestions about "4 Women Fatally Shot inside an Apartment" is important to us, you may share it by using the comment box below.